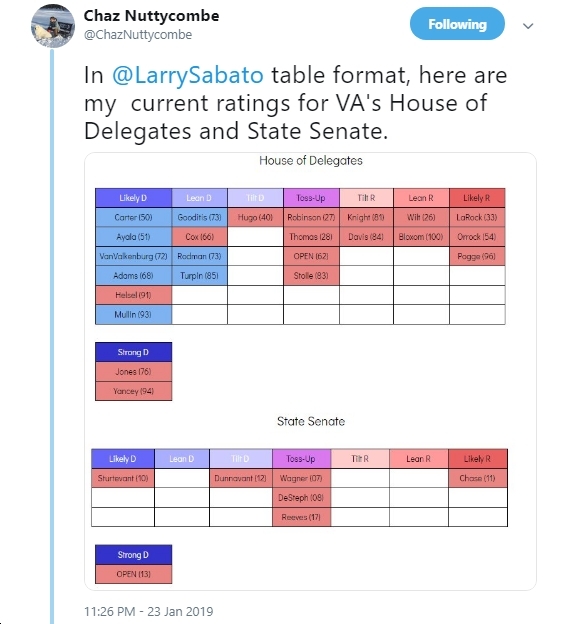 See below for the latest from Virginia political analyst/number cruncher/mapmaker Chaz Nuttycombe. In short, it is *NOT* looking good for House Speaker Kirk Cox (either for his majority OR for his own seat – Democrat Sheila Bynum-Coleman running against him? ), for House Appropriations Committee Chair Chris Jones (R-HD76), Del. Gordon Helsel (R-HD91), Del. David Yancey (R-HD94), Del. Tim Hugo (R-HD40), Senate Majority Leader Tommy Norment (at least for his Republican majority), Sen. Glen Sturtevant (R-SD10), Sen. Siobhan Dunnavant (R-SD12), and possibly a bunch more Republican General Assembly members. Sad, eh? P.S. Of course, we have to make sure this scenario comes to pass, so do NOT take your eyes off the prize, make sure you donate and volunteer, etc.